KASILOF – With autumn tightening its grip on Alaska, the state's first-ever commercial marijuana harvests are underway. At Greatland Ganja, a marijuana grow in this small town on the Kenai Peninsula, brothers Leif and Arthur Abel are nearly finished pulling their cannabis plants from the high tunnels they call "gnome domes," where 10 different strains grew throughout the summer. "We've got probably over half our crop already dried and partly cured," Leif said Wednesday, standing in one of the facility's four rooms, surrounded by bins of marijuana being processed by workers. Around 75 pounds of dried marijuana had been processed so far, Leif said. The company is hoping for roughly 100 pounds from this first crop. 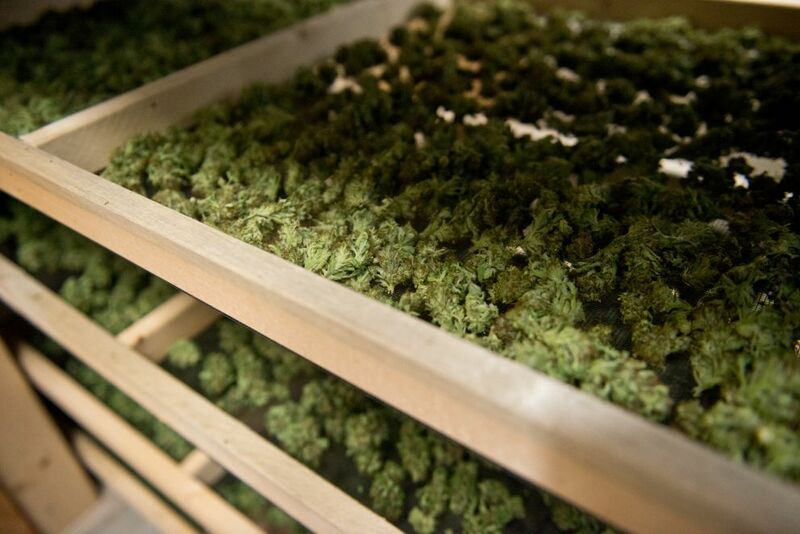 Walk into Greatland Ganja's compact facility and drying marijuana hangs high overhead. 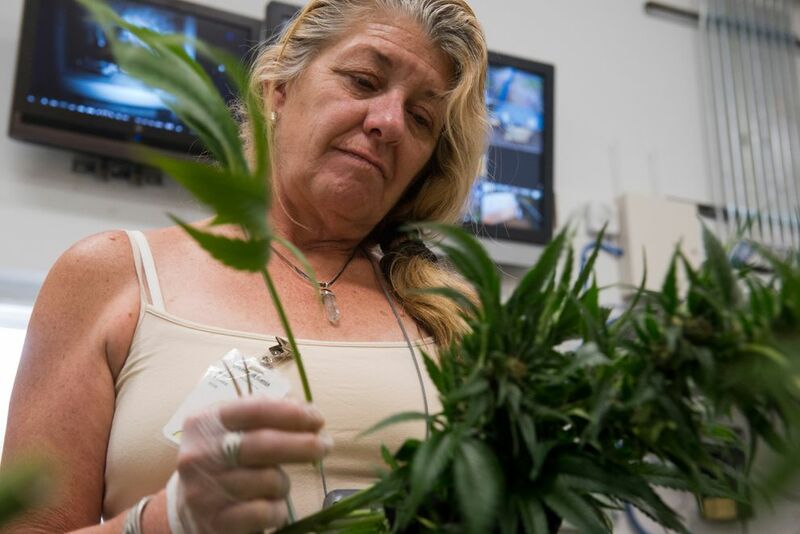 In an adjacent room, immature cannabis plants are stacked on shelving units that reach up to the ceiling; in the office, workers trim buds from plants recently pulled from the ground. A vertical drying rack system that pulls from the wall can dry 100-200 pounds of cannabis at a time, Leif said. Arthur, who runs the family construction company, designed the facility to incorporate vertical space, cutting down on costs. Things haven't completely gone according to plan. 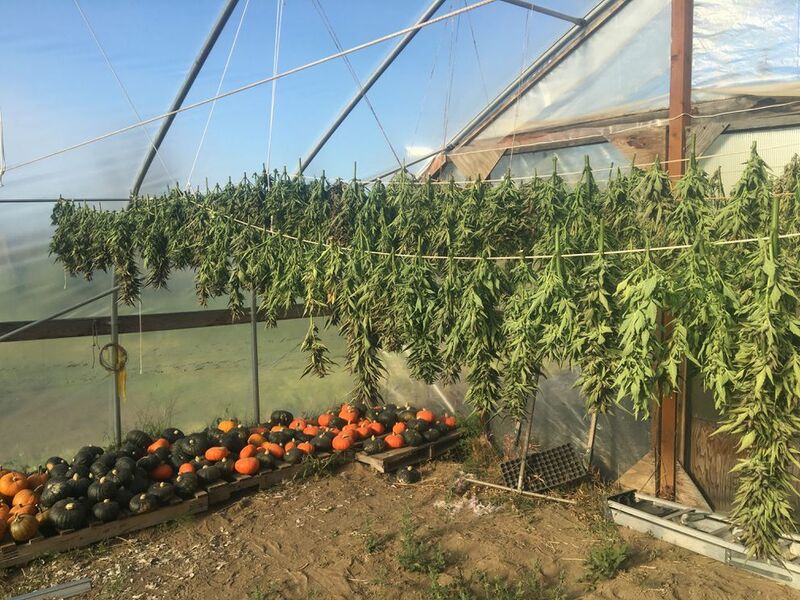 As the weather turned, they had to pull the strains that are more susceptible to the cold. Delays in shipping and construction have led to some plants hanging out in immature stages longer than desired as the brothers build their indoor grow space. 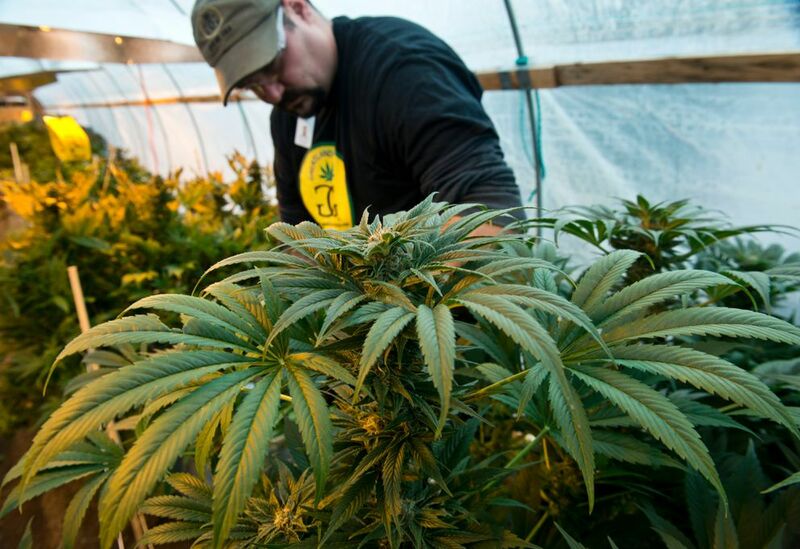 They knew it'd be difficult to transition from a small medical grow to a commercial scale. "I felt very prepared for the job, but I'm constantly learning," Arthur said. The company's indoor hydroponic system still needs finishing. And their marijuana can't go anywhere, for now. Each batch of marijuana must be tested by a state-licensed testing facility, which so far remain closed. "This process means nothing to anybody until the labs are open," Leif Abel said. Only two labs are nearing completion, and both are in Anchorage. CannTest, located in Anchorage's Ship Creek area, is hoping to open in mid-October, CEO Mark Malagodi said Thursday. AK Green Labs hopes to open in early November, according to owner Brian Coyle. Meanwhile, Greatland Ganja has been in talks with retailers for about a year, Leif said. So far, the prices are unknown, but Leif estimated $15 a gram for B-grade buds. "It's hard to give out a price list until your product is dried and cured and you've got it lab tested," he said. At $800 a pound, state taxes are more than half of their production costs, Leif said. "This year we'll probably be paying the state over $100,000, just for this one harvest," he said. Meanwhile in Fairbanks, Rosie Creek Farm is also wrapping up its first harvest. Rosie Creek was the second grow to be licensed in the state in July. It began pulling up plants about a month ago, owner Mike Emers said Thursday. A relatively late start in the season, followed by a rainy summer, made growing outdoors more challenging, Emers said. Luckily, September's weather has held steady, with only a few days of frost. "We're just trying like heck to beat freezeup and get the rest of the stuff out of the field," Emers said. Statewide, 12 commercial facilities are up and running. Half are in Fairbanks. The others are in North Pole, Juneau, Valdez, Seward, Sterling and Kasilof. Subsistence Products, a limited cultivation facility in Fairbanks (defined as a grow with less than 500 square feet of plant space) also started harvesting this week, owner Karl Hough said. Other grows are close behind. Pakalolo Supply Co., Tanana Herb Company, LLC, Green Rush Gardens, LLC, and Elevated Innovations are all about three weeks from harvest time, each company said Thursday. Meanwhile, the state will be licensing the first marijuana retail store in the first few days of October, Remedy Shoppe in the Southeast community of Skagway. For Greatland Ganja, the brothers will continue building and processing their crop, waiting for the next stages to begin. "I look at this as a successful business right now because we've made it this far. The licensing has been a huge hurdle and funding has been a huge hurdle," Arthur said. "But the big landmark for me is when we start to see income. No business is successful without making income, and at this stage of the game we have not made a dime." Laurel Andrews was a reporter for the Anchorage Daily News, Alaska Dispatch News and Alaska Dispatch. She left the ADN in October 2018.